While automatic drip coffee makers are convenient, learning how to use a French press can make a huge difference when it comes to the flavor and quality of your daily cup of coffee. 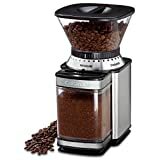 Since French press coffee makers are manual coffee makers, you have far more control over the quality of your brew than you would with an automatic drip coffee maker. If you are new to manual coffee brewing, learning how to use a French press may seem a bit daunting. While a French press coffee maker takes more time and effort than a drip coffee maker, you get rewarded in the end with a more aromatic and flavorful cup of coffee. While it may seem like there are a lot of things to learn, it is effortless once you get the hang of it. With just a few simple items and a few tips from the experts, you can be on your way to great tasting French press coffee. To learn how to use a French press to make a superior cup of coffee, you will need the following items: a French press, coffee grounds, and water. The most critical piece of equipment to make French press coffee is, of course, a French press coffee maker. 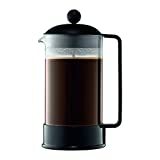 A French press coffee maker consists of two main parts: the carafe and the plunger assembly with a lid and a mesh screen. The carafe is the container that holds the coffee grounds and water. Although often made from heat-resistant glass, any material that can hold hot coffee like stainless steel or porcelain is also common. The plunger, lid, and filter screen are often part of the same assembly. The filter screen and structure lid are usually made of metal and fit on the bottom of the plunger. You push down on the plunger to push the screen and structure lid down to the bottom, allowing you to strain out the used coffee grounds. French press coffee makers come in different materials, capacities, and price points. For example, a simple glass and steel French press like the Bodum Brazil French Press Coffee Maker is less than a hundred dollars. 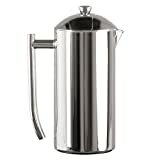 Meanwhile, a high-end, all-stainless steel construction French press like the Frieling 36-ounce Insulated Stainless Steel French press, available for online. Feel free to use your favorite coffee grinds with your French press. Whatever beans you use, make sure to grind your coffee correctly. Food website Serious Eats recommends that your coffee grounds “appear somewhere between coarse salt and steel cut oats” in size and texture. After you brew, If you find that your coffee is too weak try a slightly finer grind. Conversely, if it is too strong, try a coarser grind. But be aware that using coffee that ground too finely will result in the grounds passing through the filter, giving you a muddy cup of coffee. The water you use can either elevate your coffee to greatness or render a cup of joe into icky tasting slop. Did you know that the Specialty Coffee Association has standards for water that you use to brew coffee? Some specialty coffee shops even invest in specialized water filtration equipment to ensure that their water complements their beans. While you do not have to go quite that far, good water will help make a great cup of coffee. Use fresh, cold water, the kind that you would want to drink straight. Consider getting a filter if your standard tap water leaves something to be desired. Bottled water, either purified or spring water, may also be another option if your tap water is not sufficient. You will also need a spoon to stir your coffee. A long-handled spoon is best, and a wooden spoon is safer if you are using a French press made from glass because metal can break the glass. These next items are not “must-haves” when it comes to making French press coffee. However, if you are serious about making coffee, they are great to have on hand to ensure the perfect brew. We mentioned earlier that you need to use coarse ground coffee in your French press. Consider grinding your own beans every time you brew. By grinding your beans right before you brew, you help the beans retain their flavor. Also, grinding your beans every time you brew also helps you control the size of your coffee grounds. There are two main types of coffee grinders: blade grinders and burr grinders. Blade grinders essentially chop the coffee beans into little pieces. Burr grinders crush the bean between two burrs. Coffee purists often eschew blade grinders because they produce an uneven grind. However, blade grinders are much more affordable. For example, the Krups F203 Electric Coffee and Spice Grinder, which made Business Insider’s best coffee grinder list, is available online from places like Bed Bath and Beyond and Walmart. Conversely, burr grinders crush the beans more evenly, making them a superior choice for coffee aficionados. However, they can get pricey. On Business Insider’s list, the Cuisinart DBM-8 Supreme Grind Automatic Burr Mill, their budget pick for an electric burr grinder, ranges in price online from outlets such as Everything Kitchens, and Dillard’s. Business Insider’s top choice, the Baratza Encore 485 Coffee Grinder online from coffee specialty shops like Prima Coffee and Seattle Coffee Gear. According to the website Coffee FAQ, an easy way to measure for home brewing is to use two tablespoons of coffee per six ounces of water. However, the issue with using volume measures like tablespoons is that depending on the grind, one tablespoon of coffee grinds can vary in weight. The best way around this is to weigh your coffee and water, rather than to measure by volume. Using a digital scale can help take out the guesswork. A simple digital scale like the Ozeri Touch Digital Kitchen Scale is available from online retailers like Bed Bath and Beyond and Walmart. Here is how to use a French press to make a great cup of coffee, every time. Heat your water using your favorite method. The optimal temperature for brewing French press coffee is between 190 and 200 degrees Fahrenheit. If you are not using a thermometer, bring your water to a boil and then take it off the heat to let the water settle down for a minute. This step is optional. Once your water is heated, pour some of the boiling water into the carafe of your French press. This will help warm the container and keep your coffee warm after it has brewed. Let the water sit in the carafe for a minute or so and then pour it out. Measure your coarse-ground coffee and place it into the carafe of your pre-heated French press. If you are using volumetric measurements, this will be about two rounded tablespoons per 3/4 cup of water. In standard weight, this is approximately 0.35 ounces of coffee to 6 ounces of water. You may adjust up or down, according to your tastes. Pour your hot water over your coffee grounds and stir it with your spoon. Then remove the spoon and place the plunger assembly onto the French press. However, do not plunge yet. Let the coffee and water sit with the cover over the top to keep it warm for about three to four minutes. This steeping process is what releases the flavor from the beans. In general, the longer you choose to steep, the stronger the brew will be. However, be careful, as steeping for too long can result in an acrid, bitter coffee. After your coffee has brewed for long enough, you need to push down on the plunger with gentle but steady force. Doing so will force all of the brewed coffee to the bottom of your carafe. Now, pour yourself a cup and enjoy your delicious French press coffee! Once you have finished your coffee, clean the carafe and plunger assembly with mild soap and water before rinsing and drying thoroughly. Some French press coffee makers may be dishwasher safe, but always check your coffee maker instructions to make sure. Is A French Press Really Better? While it may seem a bit intimidating, learning how to use a French press, it is not nearly as difficult as you might think. Now that you know how to use a French press to make great coffee, you can experiment on your own. You will find that coffee brewed with a French press will yield an extremely flavorful cup of coffee. Next articleBurr Coffee Grinder: Are They Really the Best of the Best?